The owners of this home fell in love with the lot and the view of Kootenay Lake when they bought the property. They also knew that the house definitely needed some changes to suit their needs. This photo shows the house partway through the demolition. 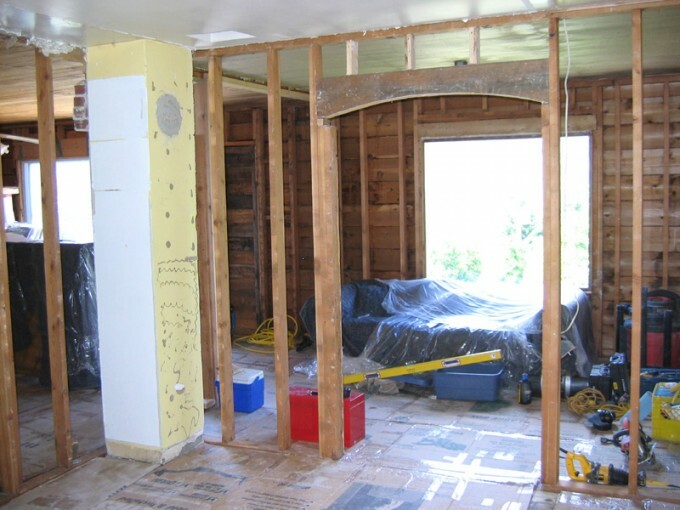 In a large renovation project like this, opening up the walls right to the original framing is a good idea to ensure proper insulation, wiring and plumbing. We also wanted to check for any rot in the walls and make sure that the previous framing was structurally sound. In this house, the plumbing in the walls was faulty and needed to be fixed, and no insulation was found. So these things were taken into account as we began the renovation according to the remodel plans.